Impact crater or supervolcano caldera? At first glance, the region covered by this latest Mars Express image release appears to be pockmarked with impact craters. But the largest structure among them may hold a rather explosive secret: it could be remains of an ancient supervolcano. 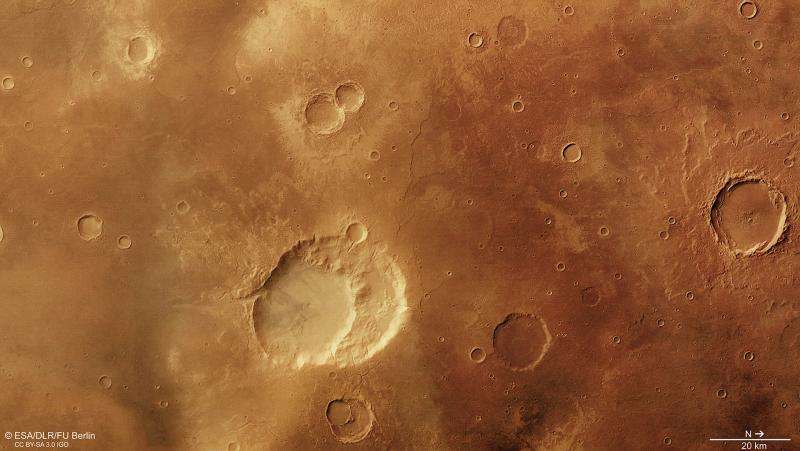 The images presented here were taken by the high-resolution stereo camera on ESA's Mars Express on 26 November 2014, and focus on the Siloe Patera feature in the Arabia Terra region of Mars. Siloe Patera comprises two large nested craters, close to the centre of the main colour image. The outer rim measures about 40 x 30 km and, at its deepest point, the crater dips as low as 1750 m below the surrounding plains. Some scientists believe that Siloe Patera and a number of similar features in Arabia Terra are calderas, the collapsed centres of volcanoes. But not just any volcanoes: these are thought to be martian supervolcanoes. On Earth, a supervolcano is defined as a volcano that can produce at least 1000 cubic kilometres of volcanic materials in an eruption – thousands of times larger than 'normal' volcanic eruptions and powerful enough to alter global climate. An example is the Yellowstone caldera in the United States. Supervolcanoes occur when magma is trapped below the surface, leading to a huge built up in pressure. They erupt suddenly in violent explosions and thus do not 'grow' sloping mountains like Olympus Mons. That makes them hard to identify, especially millions or billions of years later. 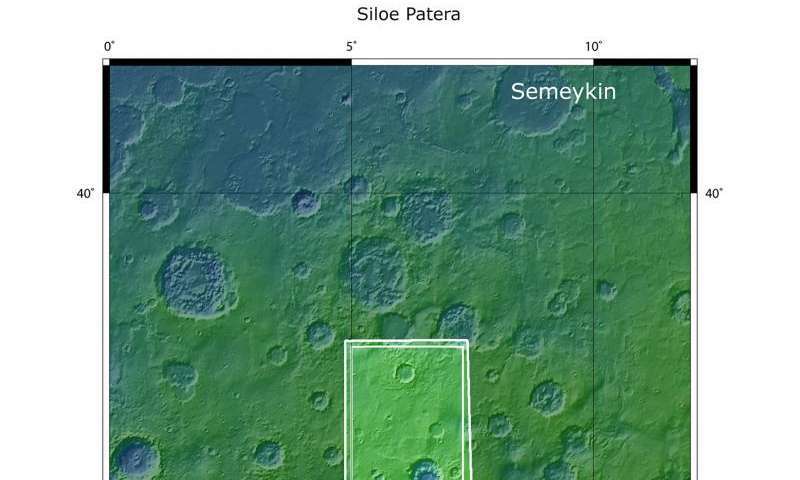 But a number of irregularly shaped craters have been detected in the Arabia Terra region that could represent a family of ancient supervolcano calderas. Siloe Patera is one such example. It is characterised by two depressions with steep-sided walls, collapse features and low topographic relief. The two depressions could even represent two different eruptive episodes due to collapse as the underlying magma pressure was released, or as the magma chamber migrated below the surface. By comparison, impact craters include features such as a central peak, uplifted crater rims and ejecta blankets surrounding them. Indeed, impact craters are widespread in this scene: textbook examples can be found in the two side-by-side craters just above Siloe Patera, and in the large crater at the far right of the scene. These craters each exhibit a central peak, terraced crater walls and a surrounding ejecta blanket. An impact crater with depth to diameter ratio comparable to Siloe Patera would be expected to show these features – unless perhaps the crater had undergone extensive erosion or modification – but it does not. Looking in more detail at Siloe Patera, as shown in the perspective view, numerous small channels and gullies are seen, cut into the walls and partly flowing into the depression. A prominent valley-like feature is present in the foreground, which cuts into the depression on one side. The valley, along with numerous other small channels in the immediate vicinity, appears to cut through material to the lower left of the craters that could be either ejecta from an impact or volcanic flow. If it is impact ejecta, then its asymmetric distribution could be explained either by an oblique meteoroid impact or by selective erosion of the blanket. Alternatively, it could be the product of lava flow from this part of the caldera. Arabia Terra is already known to comprise plains of fine-grained, layered sulphate- and clay-bearing materials. The source of the material has been much debated, but lava and dust from eruptions could be the explanation. Without any doubt, more data and high-resolution coverage – and even in situ sampling – would be necessary to resolve this mystery. 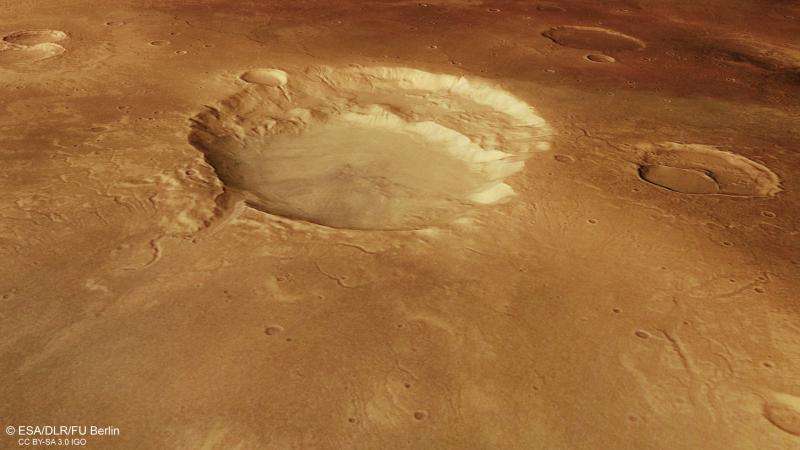 And since the gases released in supervolcano eruptions could have had significant effects on the martian climate, this is a topic of great interest. Electrical scaring. No debate there. You are correct - no real debate here. You need not be scared of electricity gkam, it's your friend. Sorry about the down vote, I meant to give you a "5". This image shows the original larger crater with a secondary crater positioned on the first's perimeter. This is a common pattern seen in discharges to dusty surfaces. The surrounding radiating, raised plateaus and scalloped edges are also common traits of discharges. All of these attributes are seen clearly in Olympus Mons, with multiple circularly excavated craters, always with the smaller one over the larger's perimeter... the only possibility in an electrical mechanism. i will say it again: there is no reliable evidence supporting electrical or plasma discharge formation of the caldera/crater.